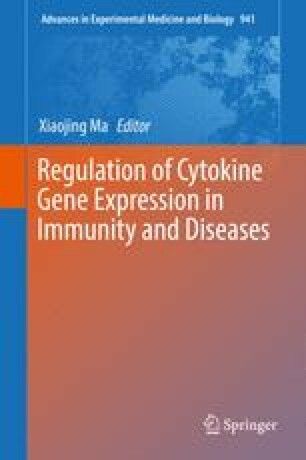 Interleukin-6 (IL-6) is a prototypical cytokine with functional pleiotropy and plays an important role in host defense. When infections or tissue injuries occur, IL-6 is promptly produced by monocytes and macrophages and contributes to removal of infectious agents and restoration of damaged tissues through activation of immune, hematological, and acute-phase responses. Once stress is removed from the host, IL-6 synthesis ends, but uncontrolled excessive or persistent IL-6 production plays a pathological role in the development of various inflammatory diseases and cancers, indicating that IL-6 is a double-edged sword for the host. Thus, the proper IL-6 expression is very important for host defense and is strictly controlled by chromatin structure, transcriptional regulation, and posttranscriptional modification. Differentiation status of cells, various transcription factors, RNA-binding proteins, and microRNAs are involved in this process. Since it is assumed that dysregulation of any of these regulatory molecules may cause abnormal IL-6 expression in a particular disease, further elucidation of the factors and processes involved in IL-6 expression can be expected to facilitate to clarification of pathogenesis and to identification of novel target molecule(s) for specific diseases.